This article is about the type of food store. For other meanings, see Supermarket (disambiguation). A supermarket is a self-service shop offering a wide variety of food, beverages and household products, organized into sections and shelves. It is larger and has a wider selection than earlier grocery stores, but is smaller and more limited in the range of merchandise than a hypermarket or big-box market. The supermarket typically has aisles for meat, fresh produce, dairy, and baked goods. Shelf space is also reserved for canned and packaged goods and for various non-food items such as kitchenware, household cleaners, pharmacy products and pet supplies. Some supermarkets also sell other household products that are consumed regularly, such as alcohol (where permitted), medicine, and clothes, and some sell a much wider range of non-food products: DVDs, sporting equipment, board games, and seasonal items (e.g., Christmas wrapping paper in December). A larger full-service supermarket combined with a department store is sometimes known as a hypermarket. Other services may include those of banks, cafés, childcare centres/creches, insurance (and other financial services), Mobile Phone services, photo processing, video rentals, pharmacies or petrol stations. If the eatery in a supermarket is substantial enough, the facility may be called a "grocerant", a blend of "grocery" and "restaurant". The traditional supermarket occupies a large amount of floor space, usually on a single level. It is usually situated near a residential area in order to be convenient to consumers. The basic appeal is the availability of a broad selection of goods under a single roof, at relatively low prices. Other advantages include ease of parking and frequently the convenience of shopping hours that extend into the evening or even 24 hours of the day. Supermarkets usually allocate large budgets to advertising, typically through newspapers. They also present elaborate in-shop displays of products. Supermarkets typically are chain stores, supplied by the distribution centers of their parent companies thus increasing opportunities for economies of scale. Supermarkets usually offer products at relatively low prices by using their buying power to buy goods from manufacturers at lower prices than smaller stores can. They also minimise financing costs by paying for goods at least 30 days after receipt and some extract credit terms of 90 days or more from vendors. Certain products (typically staple foods such as bread, milk and sugar) are very occasionally sold as loss leaders so as to attract shoppers to their store. Supermarkets make up for their low margins by a high volume of sales, and with of higher-margin items bought by the attracted shoppers. Self-service with shopping carts (trolleys) or baskets reduces labor cost, and many supermarket chains are attempting further reduction by shifting to self-service check-out. In the early days of retailing, products generally were fetched by an assistant from shelves behind the merchant's counter while customers waited in front of the counter and indicated the items they wanted. Most foods and merchandise did not come in individually wrapped consumer-sized packages, so an assistant had to measure out and wrap the precise amount desired by the consumer. This offered opportunities for social interaction: many regarded this style of shopping as "a social occasion" and would often "pause for conversations with the staff or other customers." These practices were by nature slow and labor-intensive and therefore also quite expensive. The number of customers who could be attended to at one time was limited by the number of staff employed in the store. Shopping for groceries also often involved trips to multiple specialty shops, such as a greengrocer, butcher, bakery, fishmonger and dry goods store; in addition to a general store. Milk and other items of short shelf life were delivered by a milkman. The concept of an inexpensive food market relying on large economies of scale was developed by Vincent Astor. He founded the Astor Market in 1915, investing $750,000 ($18 million in 2015 currency) of his fortune into a 165' by 125' (50x38 metre) corner of 95th and Broadway, Manhattan, creating, in effect, an open-air mini-mall that sold meat, fruit, produce and flowers. The expectation was that customers would come from great distances ("miles around"), but in the end, even attracting people from ten blocks away was difficult, and the market folded in 1917. The concept of a self-service grocery store was developed by entrepreneur Clarence Saunders and his Piggly Wiggly stores. His first store opened in 1916. Saunders was awarded a number of patents for the ideas he incorporated into his stores. The stores were a financial success and Saunders began to offer franchises. The Great Atlantic & Pacific Tea Company, which was established in 1859, was another successful early grocery store chain in Canada and the United States, and became common in North American cities in the 1920s. Early self-service grocery stores did not sell fresh meats or produce. Combination stores that sold perishable items were developed in the 1920s. Historically, there has been debate about the origin of the supermarket, with King Kullen and Ralphs of California having strong claims. Other contenders included Weingarten's Big Food Markets and Henke & Pillot. To end the debate, the Food Marketing Institute in conjunction with the Smithsonian Institution and with funding from H.J. Heinz, researched the issue. They defined the attributes of a supermarket as "self-service, separate product departments, discount pricing, marketing and volume selling." 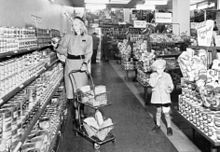 They determined that the first true supermarket in the United States was opened by a former Kroger employee, Michael J. Cullen, on 4 August 1930, inside a 6,000-square-foot (560 m2) former garage in Jamaica, Queens in New York City. The store, King Kullen, operated under the slogan "Pile it high. Sell it low." At the time of Cullen's death in 1936, there were seventeen King Kullen stores in operation. Although Saunders had brought the world self-service, uniform stores, and nationwide marketing, Cullen built on this idea by adding separate food departments, selling large volumes of food at discount prices and adding a parking lot. Other established American grocery chains in the 1930s, such as Kroger and Safeway at first resisted Cullen's idea, but eventually were forced to build their own supermarkets as the economy sank into the Great Depression, while consumers were becoming price-sensitive at a level never experienced before. Kroger took the idea one step further and pioneered the first supermarket surrounded on all four sides by a parking lot. As larger chain supermarkets began to dominate the market in the USA, able to supply consumers with the desired lower prices as opposed to the smaller "mom and pop" stands with considerably more overhead costs, the backlash of this infrastructure alteration was seen through numerous anti-chain campaigns. The idea of "monopsony," proposed by Cambridge economist Joan Robinson in 1933, that a single buyer could out-power the market of multiple sellers, became a strong anti-chain rhetorical device. With public backlash came political pressure to even the playing field for smaller vendors without the luxuries of economies of scale. In 1936, the Robinson-Patman Act was implemented as a way of preventing such larger chains from using this buying power to reap advantages over smaller stores, although the act was not well enforced and did not have much impact on the prevention of larger chains overtaking power in the markets. Supermarkets proliferated across Canada and the United States with the growth of automobile ownership and suburban development after World War II. Most North American supermarkets are located in suburban strip shopping centers as an anchor store along. They are generally regional rather than national in their company branding. 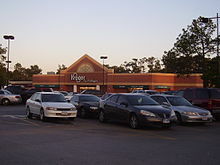 Kroger is perhaps the most nationally oriented supermarket chain in the United States but it has preserved most of its regional brands, including Ralphs, City Market, King Soopers, Fry's, Smith's, and QFC. In Canada, the largest such company is Loblaw, which operates stores under a variety of banners targeted to different segments and regions, including Fortinos, Zehrs, No Frills, the Real Canadian Superstore, and Loblaws, the foundation of the company. Sobeys is Canada's second largest supermarket with locations across the country, operating under many banners (Sobeys IGA in Quebec). Québec's first supermarket opened in 1934 in Montréal, under the banner Steinberg's. In the United Kingdom, self-service shopping took longer to become established. Even in 1947, there were just ten self-service shops in the country. In 1951, ex-US Navy sailor Patrick Galvani, son-in-law of Express Dairies chairman, made a pitch to the board to open a chain of supermarkets across the country. The UK's first supermarket under the new Premier Supermarkets brand opened in Streatham, South London, taking ten times as much per week as the average British general store of the time. Other chains caught on, and after Galvani lost out to Tesco's Jack Cohen in 1960 to buy the 212 Irwin's chain, the sector underwent a large amount of consolidation, resulting in 'the big four' dominant UK of today: Tesco, Asda (owned by Wal-Mart), Sainsbury's and Morrisons. In the 1950s, supermarkets frequently issued trading stamps as incentives to customers. Today, most chains issue store-specific "membership cards," "club cards," or "loyalty cards". These typically enable the cardholder to receive special members-only discounts on certain items when the credit card-like device is scanned at check-out. Sales of selected data generated by club cards is becoming a significant revenue stream for some supermarkets. Traditional supermarkets in many countries face intense competition from discounters such as Wal-Mart, and Tesco in the UK, which typically is non-union and operates with better buying power. Other competition exists from warehouse clubs such as Costco that offer savings to customers buying in bulk quantities. Superstores, such as those operated by Wal-Mart and Asda, often offer a wide range of goods and services in addition to foods. In Australia, ALDI, Woolworths and Coles are the major players running the industry with fierce competition among all the three. The rising market share of ALDI has forced the other two to slash prices and increase their private label product ranges. The proliferation of such warehouse and superstores has contributed to the continuing disappearance of smaller, local grocery stores; increased dependence on the automobile; suburban sprawl because of the necessity for large floor space and increased vehicular traffic. For example, in 2009 51% of Wal-Mart's $251 billion domestic sales were recorded from grocery goods. Some critics consider the chains' common practice of selling loss leaders to be anti-competitive. They are also wary of the negotiating power that large, often multinationals have with suppliers around the world. There has been a rapid transformation of the food sector in developing countries, beginning in the 1990s. This applies particularly to Latin America, South-East Asia, India, China and South Africa. However, growth is being witnessed in nearly all countries. With growth, has come considerable competition and some amount of consolidation. The growth has been driven by increasing affluence and the rise of a middle class; the entry of women into the workforce; with a consequent incentive to seek out easy-to-prepare foods; the growth in the use of refrigerators, making it possible to shop weekly instead of daily; and the growth in car ownership, facilitating journeys to distant stores and purchases of large quantities of goods. The opportunities presented by this potential have encouraged several European companies to invest in these markets (mainly in Asia) and American companies to invest in Latin America and China. Local companies also entered the market. Initial development of supermarkets has now been followed by hypermarket growth. In addition there were investments by companies such as Makro and Metro in large-scale Cash-and-Carry operations. While the growth in sales of processed foods in these countries has been much more rapid than the growth in fresh food sales, the imperative nature of supermarkets to achieve economies of scale in purchasing means that the expansion of supermarkets in these countries has important repercussions for small farmers, particularly those growing perishable crops. New supply chains have developed involving cluster formation; development of specialized wholesalers; leading farmers organizing supply, and farmer associations or cooperatives. In some cases supermarkets have organized their own procurement from small farmers; in others wholesale markets have adapted to meet supermarket needs. Most merchandise is already packaged when it arrives at the supermarket. Packages are placed on shelves, arranged in aisles and sections according to type of item. Some items, such as fresh produce, are stored in bins. Those requiring an intact cold chain are in temperature-controlled display cases. While branding and store advertising will differ from company to company, the layout of a supermarket remains virtually unchanged. Although big companies spend time giving consumers a pleasant shopping experience, the design of a supermarket is directly connected to the in-store marketing that supermarkets must conduct in order to get shoppers to spend more money while there. Every aspect of the store is mapped out and attention is paid to color, wording and even surface texture. The overall layout of a supermarket is a visual merchandising project that plays a major role. Stores can creatively use a layout to alter customers’ perceptions of the atmosphere. Alternatively, they can enhance the store’s atmospherics through visual communications (signs and graphics), lighting, colors, and even scents. For example, to give a sense of the supermarket being healthy, fresh produce is deliberately located at the front of the store. In terms of bakery items, supermarkets usually dedicate 30 to 40 feet of store space to the bread aisle. Supermarkets are designed to "give each product section a sense of individual difference and this is evident in the design of what is called the anchor departments; fresh produce, dairy, delicatessen, meat and the bakery". Each section has different floor coverings, style, lighting and sometimes even individual services counters to allow shoppers to feel as if there are a number of markets within this one supermarket. 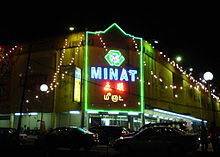 Exterior of a supermarket in Kulim, Kedah, Malaysia. Marketers use well-researched techniques to try to control purchasing behavior. The layout of a supermarket is considered by some to consist of a few rules of thumb and three layout principles. The high-draw products are placed in separate areas of the store to keep drawing the consumer through the store. High impulse and high margin products are placed in the most predominant areas to grab attention. Power products are placed on both sides of the aisle to create increased product awareness, and end caps are used to receive a high exposure of a certain product whether on special, promotion or in a campaign, or a new line. The first principle of the layout is circulation. Circulation is created by arranging product so the supermarket can control the traffic flow of the consumer. Along with this path, there will be high-draw, high-impulse items that will influence the consumer to purchase which he or she did not intend. Service areas such as restrooms are placed in a location which draws the consumer past certain products to create extra buys. Necessity items such as bread and milk are found at the rear of the store to increase the start of circulation. Cashiers' desks are placed in a position to promote circulation. The entrance will be on the right-hand side because research has shown that consumers who travel in a counter-clockwise direction spend more. The second principle of the layout is coordination. Coordination is the organized arrangement of product that promotes sales. Products such as fast-selling and slow-selling lines are placed in strategic positions in aid of the overall sales plan. Managers sometimes place different items in fast-selling places to increase turnover or to promote a new line. The third principle is consumer convenience. The layout of a supermarket is designed to create a high degree of convenience to the consumer to make the shopping experience pleasant and increase customer spending. This is done through the character of merchandising and product placement. There are many different ideas and theories in relation to layout and how product layout can influence the purchases made. One theory suggests that certain products are placed together or near one another that are of a similar or complementary nature to increase the average customer spend. This strategy is used to create cross-category sales similarity. In other words, the toothpaste is next to or adjacent the toothbrushes and the tea and coffee are down the same aisle as the sweet biscuits. These products complement one another and placing them near is one-way marketers try to increase purchases. For vertical placement, cheap generic brands tend to be on the lowest shelves, products appealing to children are placed at the mid-thigh level, and the most profitable brands are placed at eye level. The fourth principle is the use of color psychology, and the locations of the food, similar to its use in fast food branding. Consumer psychologists suggest that most buyers tend to enter the store and shop to their right first. 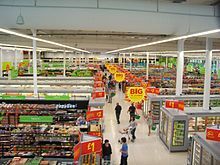 Some supermarkets, therefore, choose to place the entrance to the left-hand side as the consumer will likely turn right upon entry, and this allows the consumer to do a full anticlockwise circle around the store before returning to the checkouts. This suggests that supermarket marketers should use this theory to their advantage by placing their temporary displays of products on the right-hand side to entice you to make an unplanned purchase. Furthermore, aisle ends are extremely popular with product manufacturers, who pay top dollar to have their products located there. These aisle ends are used to lure customers into making a snap purchase and to also entice them to shop down the aisle. The most obvious place supermarket layout influences consumers are at the checkout. Small displays of chocolates, magazines, and drinks are located at each checkout to tempt shoppers while they wait to be served. The large scale of supermarkets, while often improving cost and efficiency for customers, can place significant economic pressure on suppliers and smaller shopkeepers. 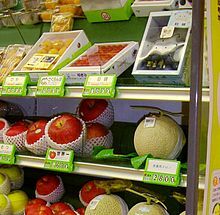 Supermarkets often generate considerable food waste, although modern technologies such as biomethanation units may be able to process the waste into an economical source of energy. ^ "Opening of the Astor market, New York City, 1915". Library of Congress. ^ "The Retailer". The Western Fruit Jobber. IV (3). July 1917. ^ Gray, Christopher (10 September 2006). "The Astor Legacy in Brick and Stone". The New York Times. ^ Gray, Christopher (5 July 1987). "Streetscapes: Thalia Theater; a closed revival house that may itself be revived". The New York Times. ^ "Lighting system for self-serving stores". google.com. ^ "Arrangement and construction of store fixtures". google.com. ^ Strasser, Susan Never Done: A History of American Housework Holt Paperbacks, 2000. The general trend since then has been to stock shelves at night so that customers, the following day, can obtain their own goods and bring them to the front of the store to pay for them. Although there is a higher risk of shoplifting, the costs of appropriate security measures ideally will be outweighed by reduced labor costs. ^ "Ralphs Grocery Company". groceteria.com. 5 February 2009. ^ Ryan Mathews, "1926–1936: Entrepreneurs and Enterprise: A Look at Industry Pioneers like King Kullen and J. Frank Grimes, and the Institution They Created (Special Report: Social Change & the Supermarket)," Progressive Grocer 75, no. 12 (December 1996): 39–43. ^ Hamilton, Shane Supermarkets, Free markets, and the Problem of Buying Power in the Postwar United States, in What's Good For Business: Business and Politics Since World War II, ed. Julian Zelizer and Kim Phillips-Fein (Oxford University Press, 2012). ^ Hamlett, Jane (April 2008). "Regulating UK supermarkets: an oral-history perspective". History & Policy. United Kingdom: History & Policy. Retrieved 9 December 2010. ^ "Supermarkets and Grocery Stores - Australia Market Research Report". ^ Csipak, James J., Rohit Rampal, and Laurent Josien. "The Effect Of A Wal-Mart Supercenter On Supermarket Food Prices: The Case Of The City Of Plattsburgh In Upstate New York." Academy Of Marketing Studies Journal 2 (2014): 251. Academic OneFile. Web. 5 Nov. 2015. ^ Moulds, Josephine (25 June 2015). "Supermarkets behaving badly – how suppliers can get a fairer deal". the Guardian. ^ Thomas Reardon, Peter Timmer and Julio Berdegue, 2004. "The rapid rise of supermarkets in developing countries"[permanent dead link]. Journal of Agricultural and Development Economics, Vol 1 No 2. ^ Kevin Chen, Andrew W. Shepherd & Carlos A. da Silva, "Changes in food retailing in Asia". ^ Andrew W. Shepherd and Eva Gálvez. "The response of traditional marketing channels to the growth of supermarkets and to the demand for safer and higher quality fruit and vegetables, with particular reference to Asia". Proceedings of the International Symposium on Fresh Produce Supply Chain Management, Chiang Mai 2006. pp. 304–313. FAO, Bangkok. ^ "NACS Magazine - Category Close Up: Take Bread to the Bank". nacsonline.com. Archived from the original on 23 February 2012. Retrieved 6 December 2011. ^ Browne, Karen (April 2010). "Trolley Psychology: Choice unlocks the psychological secrets of the supermarket and shows you how to avoid spending more than you mean to". Australian Consumer's Association Choice Magazine (4): 60. ^ Aghazedah, S 2005, "Layout strategies for some of the operations", Management Research News, vol. 28, no. 10, pp. 31–46, retrieved 8 May 2012, Business Source Complete, EBSCO host. ^ a b Park, Michael Y. (30 October 2014). "How to Buy Food: The Psychology of the Supermarket". Bon Appetit. Retrieved 27 February 2017. ^ a b Bezawada, R Balachander, S Kannan, PK Venkatesh, S 2009, "Cross-Category Effects of Aisle and Display Placements: A Spatial Modeling Approach and Insights", Journal of Marketing, vol. 73, no. 3, pp. 99–117, 3 May 2012, Business Source Complete. ^ Simple, By Yelena Moroz Alpert, Real. "How color affects your spending - CNN". CNN. Retrieved 3 March 2018. ^ a b Browne, K 2012, "Trolley Psychology: Choice Unlocks the Psychological Secrets of the Supermarket and Shows You How to Avoid Spending More Than You Mean To", Choice, no. 4, p. 60, 3 May 2012, expanded academic database. ^ Bucklin, Louis P. (November 1967). "Competitive Impact of a New Supermarket". Journal of Marketing Research. 4 (4): 356–361. doi:10.2307/3149873. ^ "Senate takes look at slotting fees". Associated Press. 15 September 1999. ^ "Unfair trading practices / supply chain". European Economic and Social Committee. 11 July 2013. ^ Mukherjee SN, Kumar S (December 2007). "Leachate from market refuse and biomethanation study". Environmental Monitoring and Assessment. 135 (1): 49–53. doi:10.1007/s10661-007-9703-5. PMID 17505906. ^ "Methanisatie - 2009, het jaar van de biomethanisering?". energymag.be. 15 September 2014. Archived from the original on 15 September 2014. ^ "Biomethanation". Asia Biomass Handbook. Japan Institute of Energy. 2008. Archived from the original (PDF) on 2 June 2015. Retrieved 11 August 2017. Petroski, Henry (November–December 2005). "Shopping by Design". American Scientist 93 (6): 491. Sowell, Thomas. Basic Economics (Third Edition, 2007 Basic Books). Pages 92–94 describe the competition between the dominant grocery chains in the United States through the 20th century and beyond. Supermarket News – Nationally circulated weekly trade magazine for the food distribution industry.